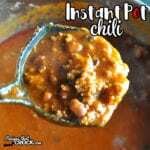 This Instant Pot Chili is the electric pressure cooker version of our much loved Slow Cooker Chili. Whether you make this recipe in your Instant Pot or Crock Pot, you are gonna love it! Brown your ground beef with your onion and drain. Put all your ingredients in your 6-quart Instant Pot and stir until well combined. Place your lid on and seal it. Cook on your soup/stew setting for 20 minutes. Let it natural release for 15 minutes before quick releasing it, if necessary. If you are looking for more Instant Pot Recipes, check out our Instant Pot Recipes Library.